Tonight's guest blogger is Jas from Jas's Blingtastic Nails. 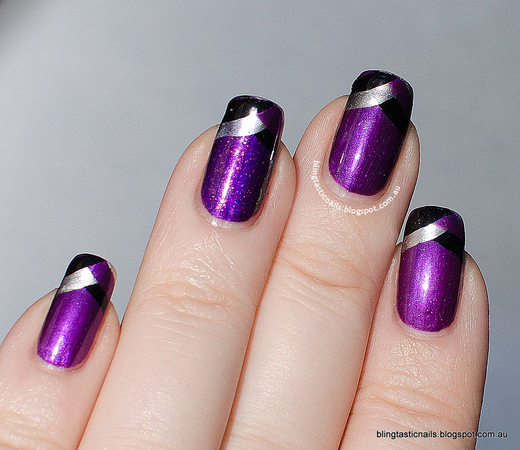 I love braided nails, and really love this look with them on the tips. Jas, show 'em what you've got. Hello everyone, my name is Jas from Jas's Blingtastic Nails and tonight I have the honor of guest posting for you whilst Cathy is away. Today I have for you a twist on a couple of trends that have been floating around for a little while. This is the love child of the Fishtail Braid manicure and the Chevron tip look. I guess it's the half braid look? 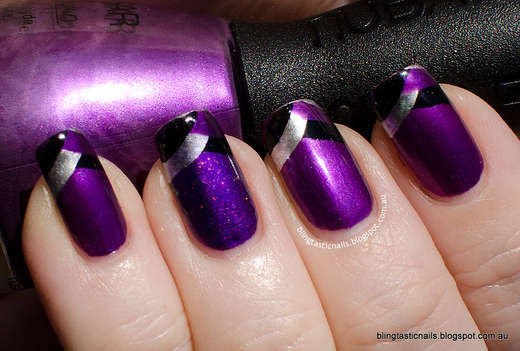 For this look I used a color I have been meaning to use for ages, Nubar Pasadena Purple. Of course, AFTER I used it I realized how hard it is to photograph, ah well, I loved the color so I hope I did it justice in the pics! 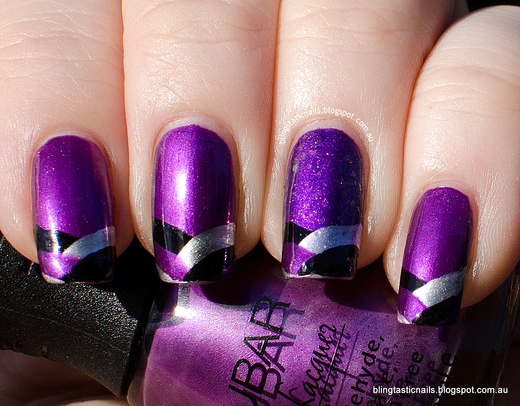 To start I did a base color with 2 coats of Nubar Pasadena Purple, this was a little tricky to apply. 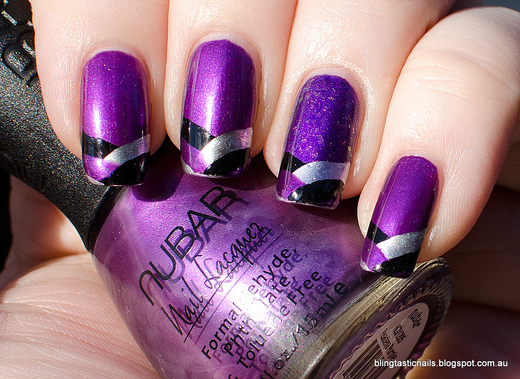 Nubar Pasadena Purple in fading light. Then starting around halfway down my nails I started to freehand the Fishtail Braid, which you can see an awesome tutorial at Lucy's Stash Fishtail Braid. I used China Glaze Liquid Leather and Millennium for the braid as I was going for an elegant look. This look was reasonably easy to do if you have a steady hand and follow the tutorial from Lucy's stash step by step. With starting half way down the nail you don't have to worry about the polish building and thickening the more layers you apply which can be a downfall in the full fishtail look. The three different polishes you chose are best if they are reasonable opaque to cover each layer as you go along, and, you could also add the half braid look to a slightly older manicure to extend the life of manicure and cover any tip wear/chipping oh-so-easily. I love this! And shame on me for not following your blog til now! Ive missed out on so much! I would be looking at my nails all the time if they looked this pretty. I love the accent with flakies! Nice design Jas!!! Love this! Only braiding the tips seems like it's so much easier than doing full braids. Pinned for future stealing, haha!